Do the presidential candidates prefer pepperoni or sausage on their pizza? 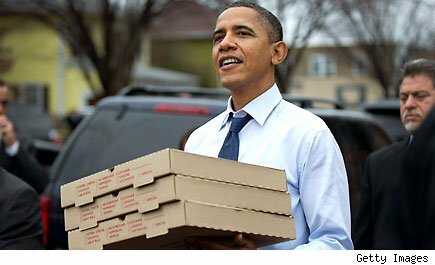 If one gutsy attendee at the second presidential debate poses this question to Barack Obama or Mitt Romney, Pizza Hut will provide him or her with free pizza for life. Unlike the first debate, which was moderated by Jim Lehrer, the second is a town hall-style format. Undecided voters, selected by the Gallup Organization, will be asking the candidates pre-screened questions at Hofstra University on October 16th. But because the debate is live, one pizza-hungry participant could go off-script, in a commercially sponsored echo of a question famously put to President Bill Clinton during a 1994 town hall sponsored by MTV: "Is it boxers or briefs?" "We recognize there are a lot of serious issues to be debated, but we also know a lot less serious -- but no less important -- ones are being discussed every night inside houses across the country," said Kurt Kane, CMO of Pizza Hut Inc., a subsidiary of Yum! Brands, Inc. (YUM), in a press release. "So for the candidates to be able to show that they're in tune with all the issues, we felt a pizza-related question on behalf of The Pizza Party was very appropriate for a town hall debate." The Pizza Party is Pizza Hut's election-themed marketing campaign, announced last week. The party's "candidate" is the restaurant's Big Dinner Box; customers are encouraged to show their support by signing up online at PizzaHut.com/PizzaParty. Those who register will receive free stuffed pizza rollers with their next online order. But a much larger reward awaits the debate audience member who is willing to go through with the pepperoni-or-sausage stunt: Pizza Hut will give them an annual $520 gift card for a period of 30 years. Alternatively, they can choose a $15,600 check. Other companies are also looking for publicity with election-based marketing campaigns. JetBlue Airways (JBLU) is offering 1,000 voters a chance to win a free flight out of the country if their candidate of choice loses. And Cabbage Patch Kids maker JAKKS Pacific (JAKK) will be auctioning a line of dolls that resemble the candidates, their VPs, and Michelle Obama, as a fundraiser for Rock the Vote. What do you think of marketing campaigns based around a presidential election? Should companies respect the seriousness of these debates, or is it OK to have a some fun? Sound off in the comments, or tweet us @Daily_Finance.